http://www.facebook.com/album.php?aid=15843&id=100000602567895&l=bb92ad8ad9 for some gorgeous and fascinating photos of that last time I traveled to Ethiopia with teachers. 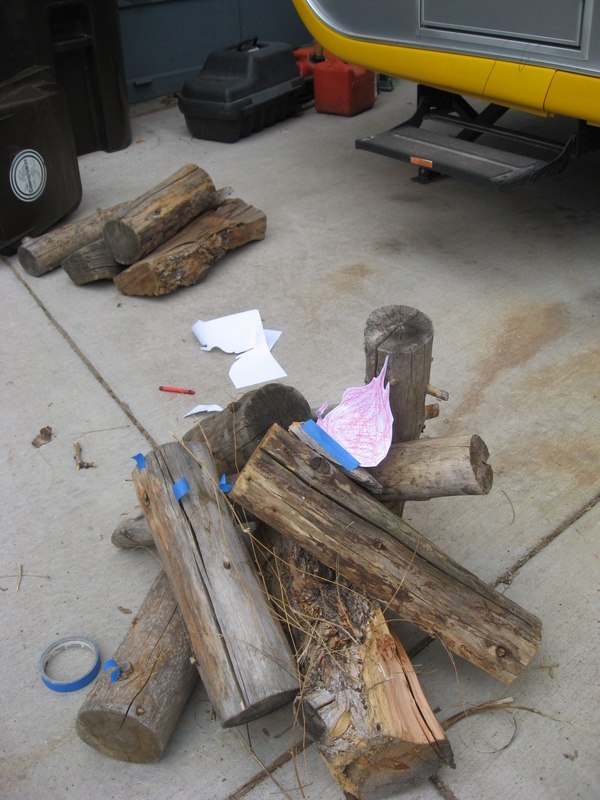 In other news…a new American Girl store in my back yard! I already had a lovely tea party and signing in the Kansas City area. This store will be a huge hit. 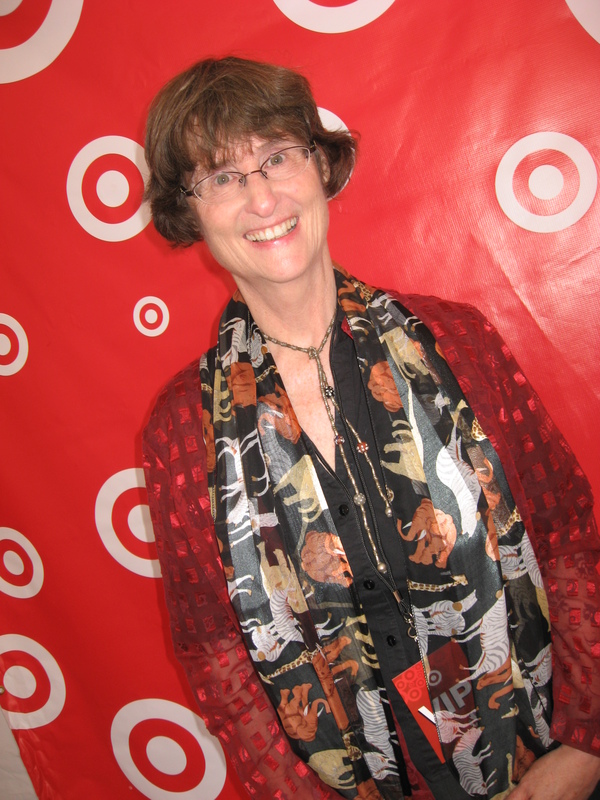 Middleton, WI—May 17, 2010: American Girl®, a division of Mattel, Inc., today announced plans to open its newest experiential retail store at Oak Park Mall, the premier regional mall in the Kansas City metropolitan area located in Overland Park, Kansas. New adventures are bubbling out of an author presentation I did in Portland in May (with my brother) at a very cool gardening school. I got a chance to meet one of the real champions of orangutans–a young starfish thrower who spoke with great poise about orangutans. She’s making a difference in the world. Ditto with the teacher who set up the visit and who is buying a classroom set of my brother’s novel (just released in May) to continue her work of getting kids excited about reading. And the last thrilldom tidbit? A birthday! Wowee three. 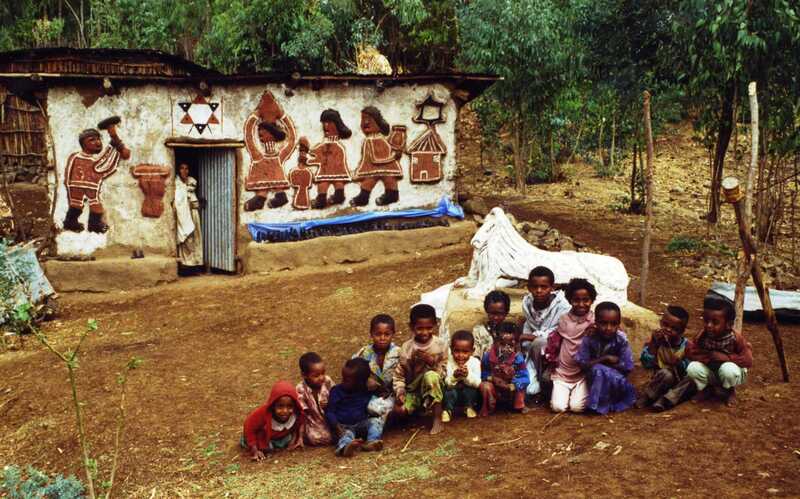 Back in Ethiopia, where my grandson’s mom grew up, I don’t know whether birthdays are such a big deal. (Hiwot sure wasn’t picky about getting the number of candles right.) But daycare is full of birthday talk. 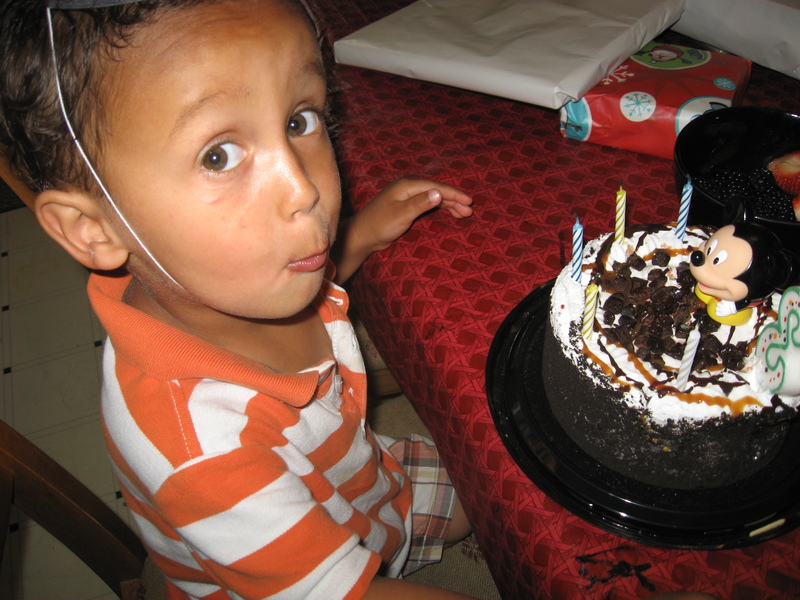 (In fact, whenever we offended my granddaughter this spring, she said, “You’re not invited to my birthday party.”) So around here, birthdays are as big as it gets. 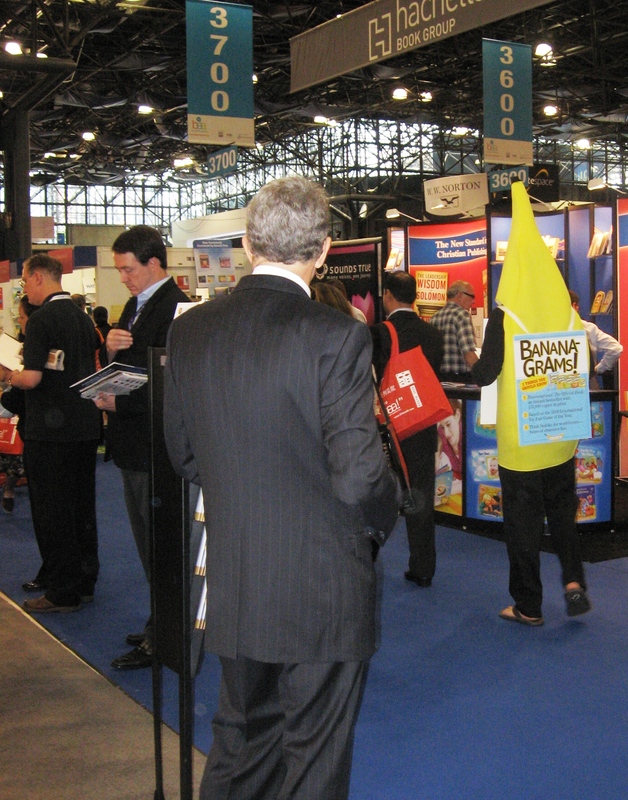 Book Expo…an overnight grand dash into grand New York City to sign sign sign for Lanie fans. 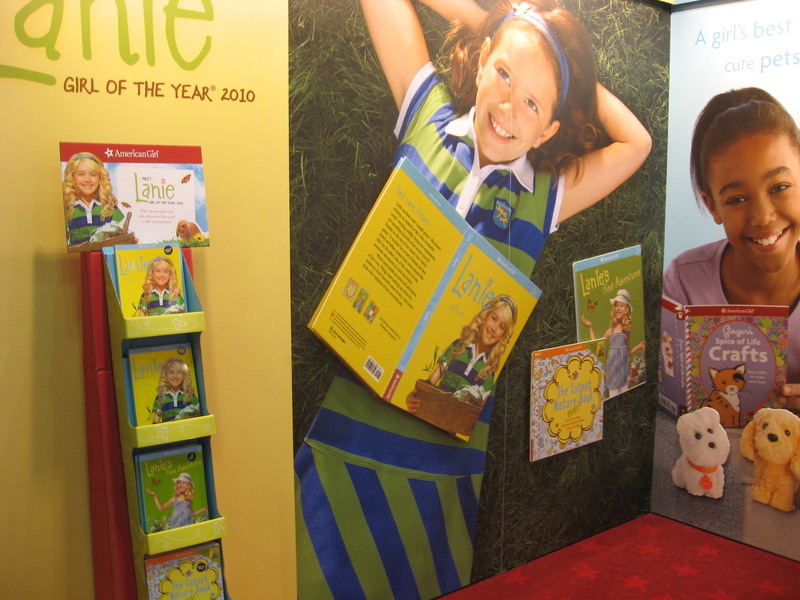 I sat down at a table in the American Girl booth at 10:30 and barely had time to look up–beyond people’s faces–for a couple of hours until all the Lanie books were gone. 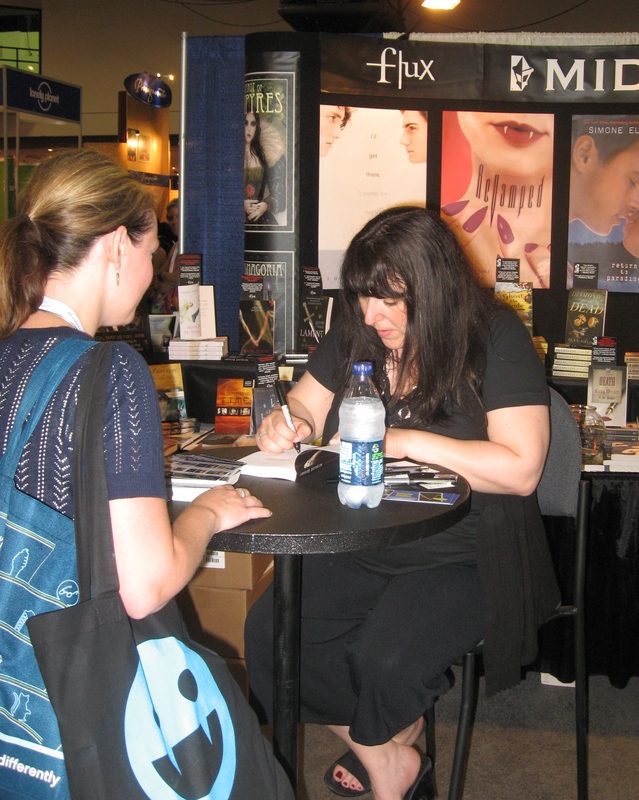 Then I signed a few bookmarks for people looking around mournfully and hopefully…only to find that, alas, the books were gone…before wandering up and down the BEA aisles and around and around in a hazy daze. That morning, Sarah Ferguson had been in the autograph area signing her new Helping Hands books. Yes, BEA is that kind of place. 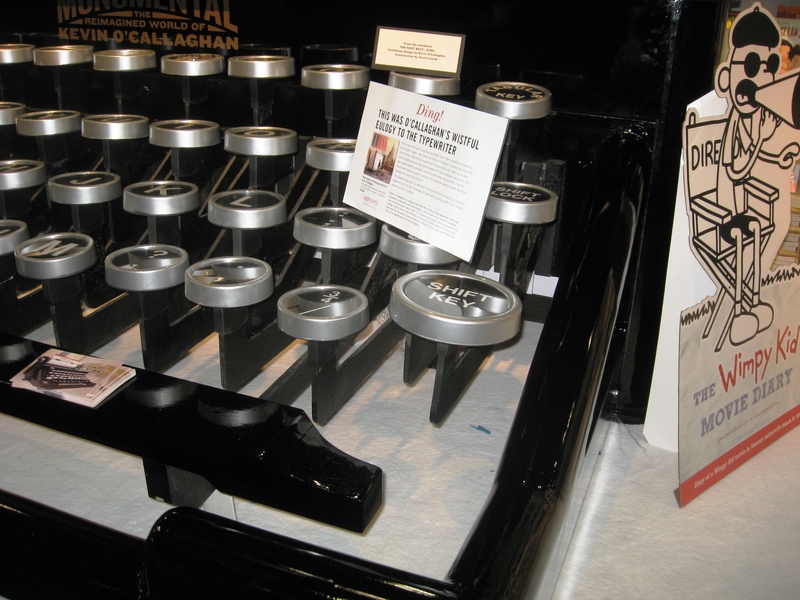 It’s the kind of place where you walk by an enormous manual typewriter the marketing people hoped would draw attention to a book, Monumental: The Reimagined World of Kevin O’Callaghan. It’s the kind of place where the first fans lined up at 8:45 a.m. for a 6 p.m. keynote by Barbra Steisand, who has written a book on design. It’s the kind of place where long lines snaked toward Fergie and Barbra and Neil Sedaka (Waking Up is Hard to Do) and someone with vampire teeth behind her and more vampire teeth on the fans’ bags. It’s the place of Lemony Snicket and Rick Riordan and Have a New You By Friday. It’s men in suits. All kinds of suits. And, yes, it’s a place where readers and publishers and marketing people gather and gawk and do their part to make sure the flame of book publishing doesn’t go out even though it flickers a lot these days, especially in the traditional places where stories are written and sold and taught. 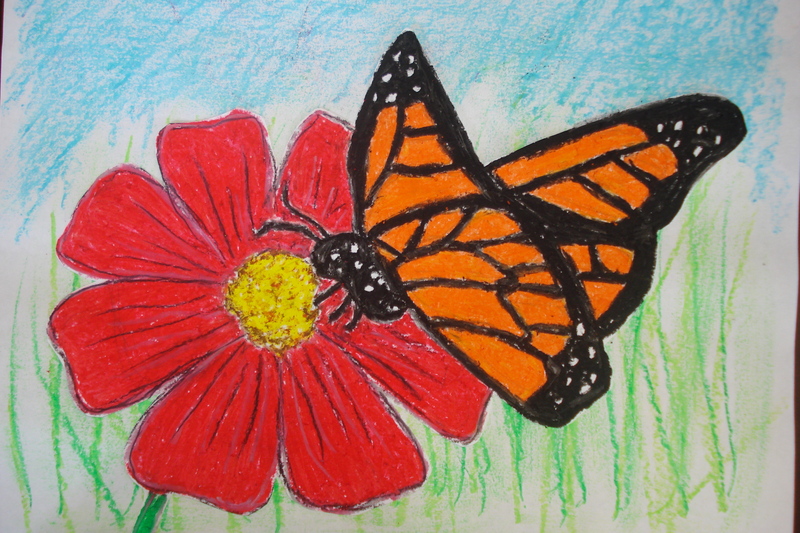 I’m glad I was there with Lanie and got to hear a story of monarch butterfly wings in a preserve in California, so many wings beating that a person can stand and listen to the sound. 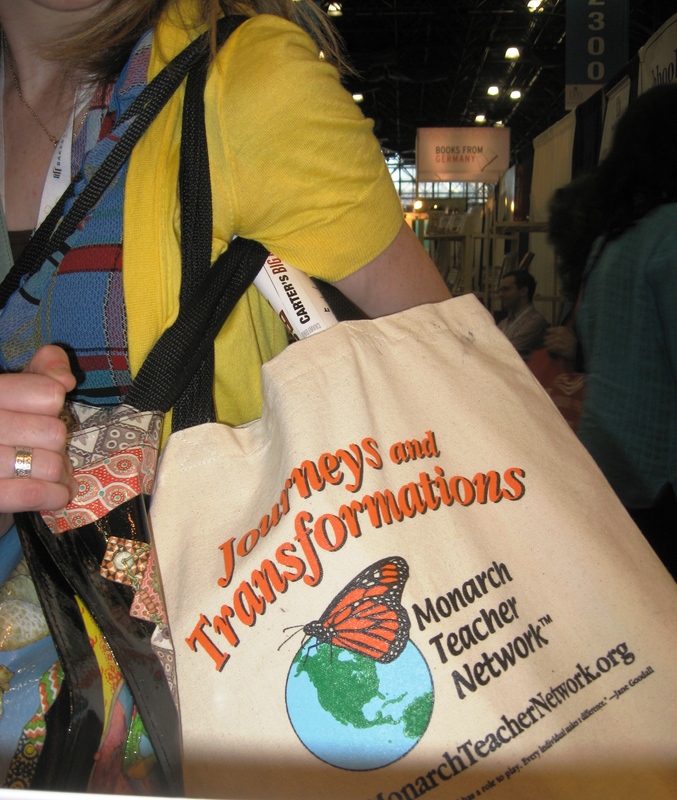 I’m glad in that loud and glitzy place I got to meet some of the teachers and librarians and parents who talk about quiet, precious things like monarchs…and books. 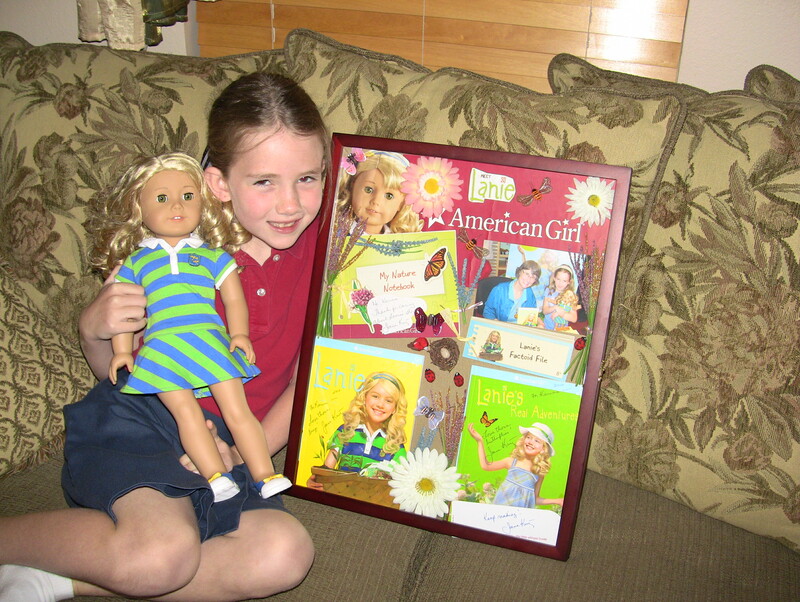 How did you come to write for American Girl? The life of a freelancer and writer weaves itself into interesting patterns and tangles and knots. 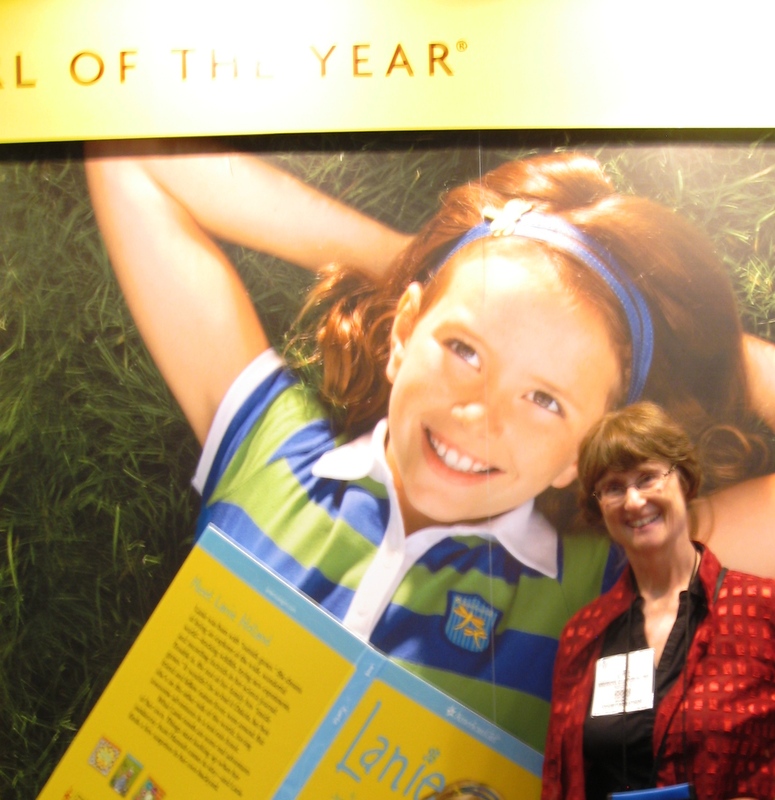 How did I come to write for American Girl? That true story probably started when I was invited back to Ethiopia to speak in schools, and the schools offered me a trip anywhere. I asked to go north because I was working on my first novel, The Storyteller’s Beads. 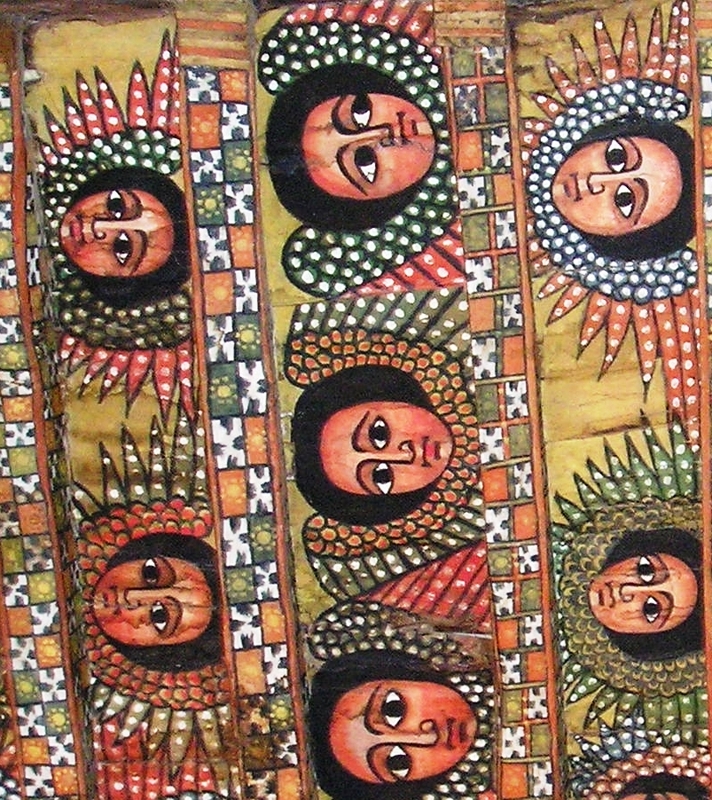 I wanted to see a Jewish Ethiopian village and the landscape my character Rahel travels as she flees from Ethiopia. 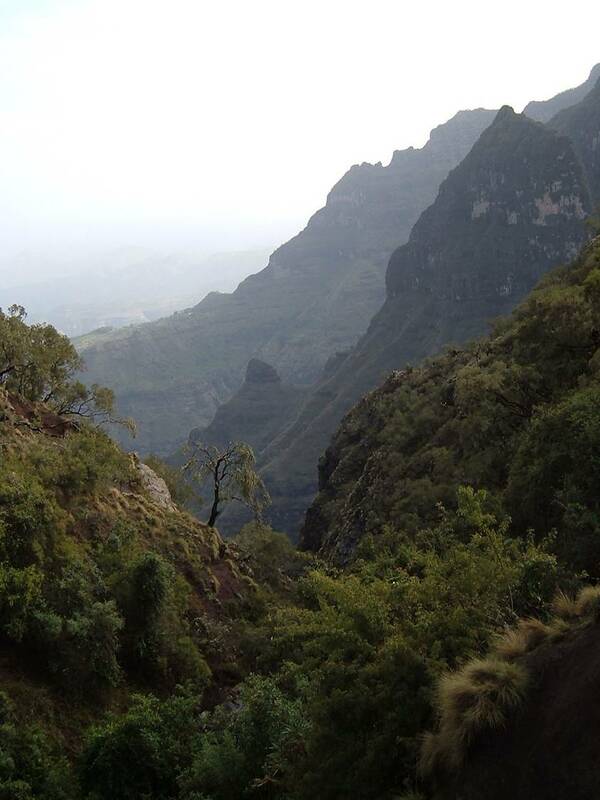 I grew up in the mountains of southwest Ethiopia. In the amazing mountains of the north, kingdoms rose and fell for centuries as kings and warriors struggled for power. Power moved from the far north (Axum) to Lalibela, whose kings dreamed of a new Jerusalem in Ethiopia, and eventually to Gondar. 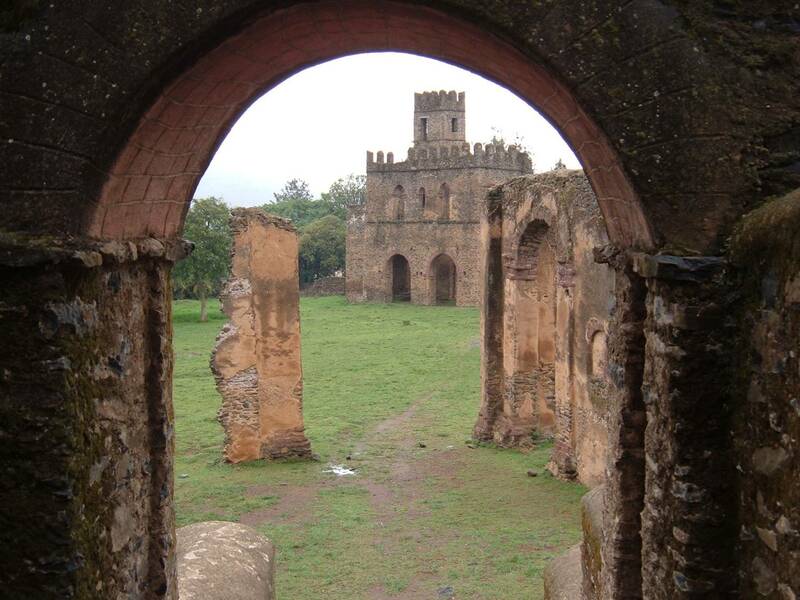 I saw the ruined castles of Gondar when I was a girl, but I had never studied their history. 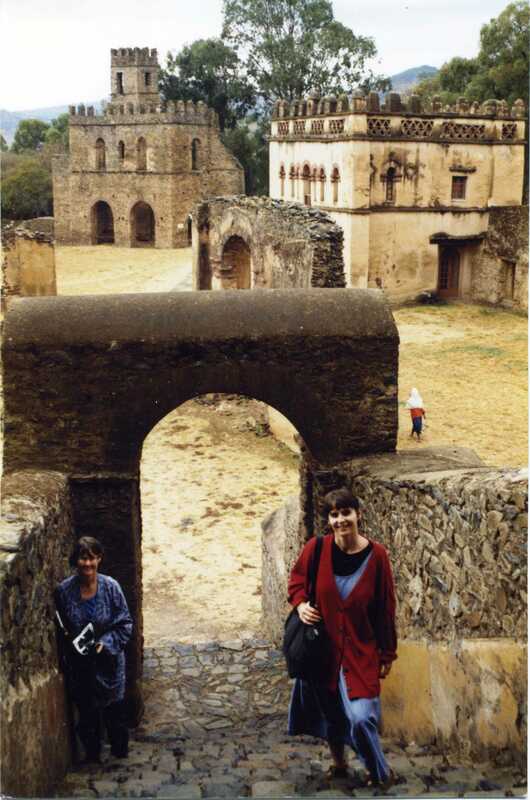 The year I went back to Ethiopia as a published author, I went back to Gondar. The castles were as fascinating as ever. So were the angels painted on the ceiling of a church nearby. When American Girl decided to try a series called “Girls of Many Lands,” featuring 12-year-old girls living all over the world in different historical periods, they got in touch with me. 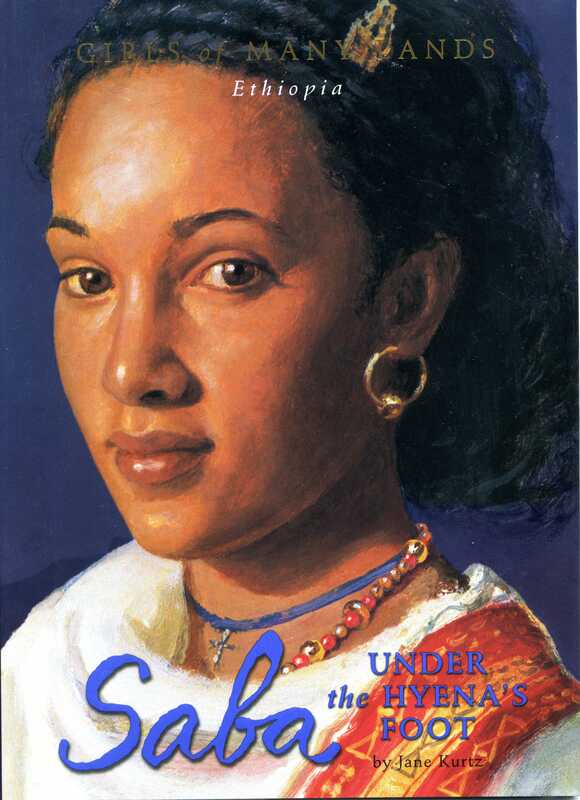 I said I would love to dig deeply into the history of those castles, those angels–and that’s how my first novel for American Girl, Saba: Under the Hyena’s Foot, came to be. My daughter was a big American Girl fan, bu t I didn’t really understand what I was becoming part of until I got to Chicago to sign copies of Saba. I was looking nervously at the store’s address on a piece of paper, when I looked up and noticed all the girls with their dolls–all walking in the same direction. Ah-hah. 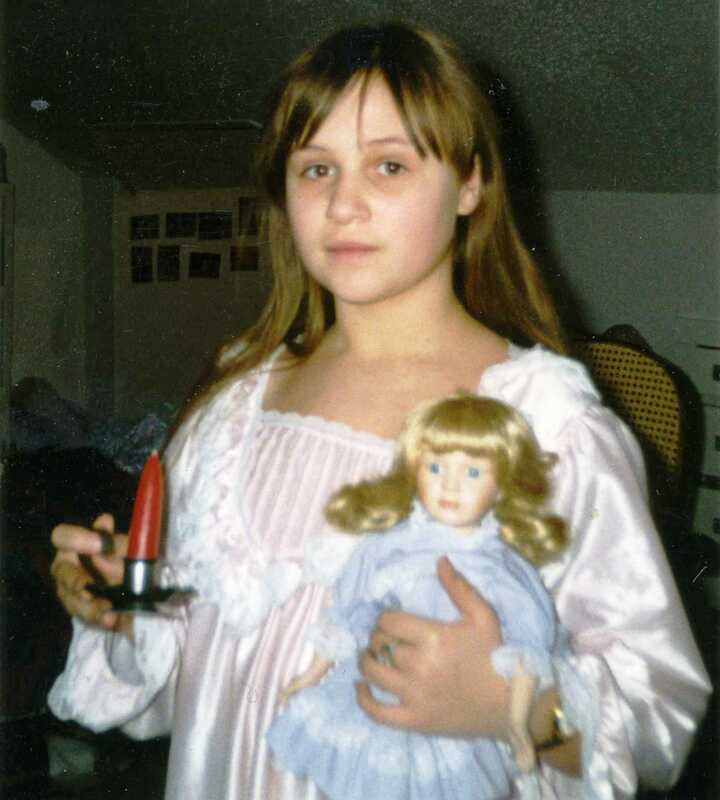 I’d just discovered huge American Girl love. I also got to sign in the New York City store with my friend Mary Casanova, who wrote Cecile, another of fthe “Girls of Many Lands” books (set in France). I liked working with the editor of Saba: Under the Hyena’s Foot. 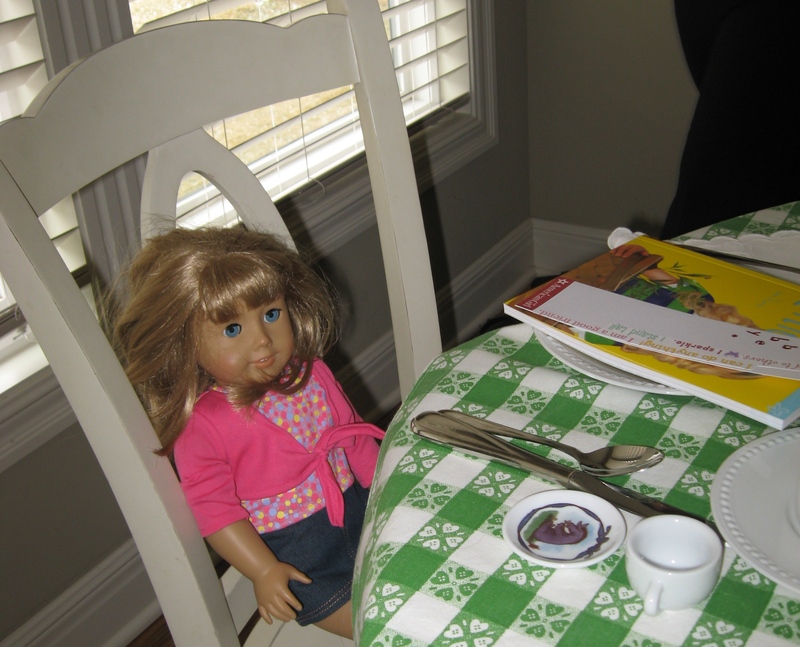 I was impressed by American Girl’s passion for details. I learned a lot about research from poking around in a complicated time in Ethiopian history, when the warriors were strong and the kings were weak, when the power of Gondar was crumbling and about to drift south once again toward the new capital of Addis Ababa. Fast forward to April 2008. 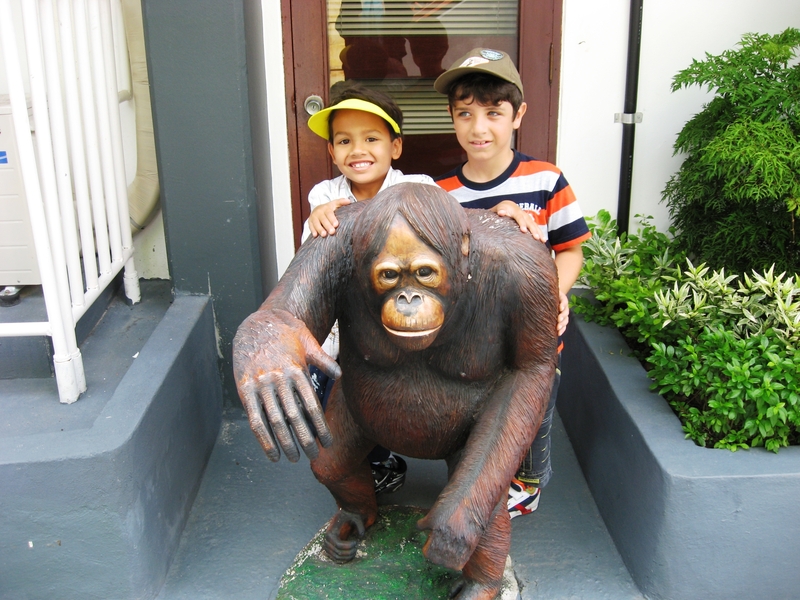 I was doing another international school visit, this time at a school in Indonesia that has a project to save orangutans–and I got an email from the editor of Saba. Check it out! She’d liked working with me, too. She asked if I wanted to tackle writing the books for the American Girl doll of the year. I couldn’t say “yes” fast enough. The “Girls of Many Lands” series, alas, didn’t stay around long. But Saba is available at www.ethiopiareads.org or on amazon.com through Down Home Books, and the money goes to help kids in Ethiopia read books. 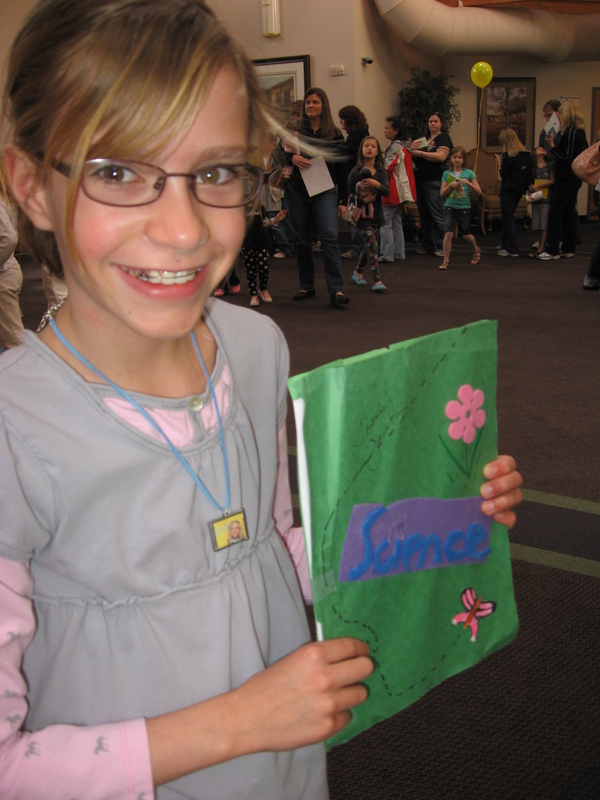 And Saba led to Lanie and my exciting 2010 spring. Where do authors get their ideas? Actually, a novel takes hundreds of ideas. Every scene has to be built around an idea. Every scene has to include the right details to coax the reader to feeeeel something or think about something in interesting ways. I think most authors reach first into their own memory banks as they shape scenes. If Lanie was a girl longing to get outside, stuck in a family with inside genes, I assumed she’d long to go camping. That’s because my memory bank is full of camping–with my mom and dad, with my sisters and brother (and now their families), with my kids. 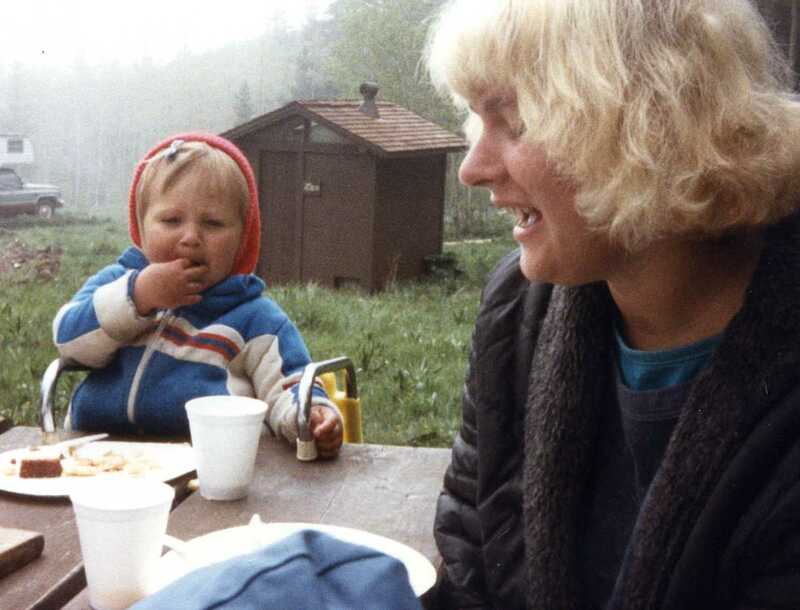 When I decided on a scene where Lanie’s family would explain why they don’t want to go camping, it was pretty easy to remember details of a few miserable camping trips I’d been on. 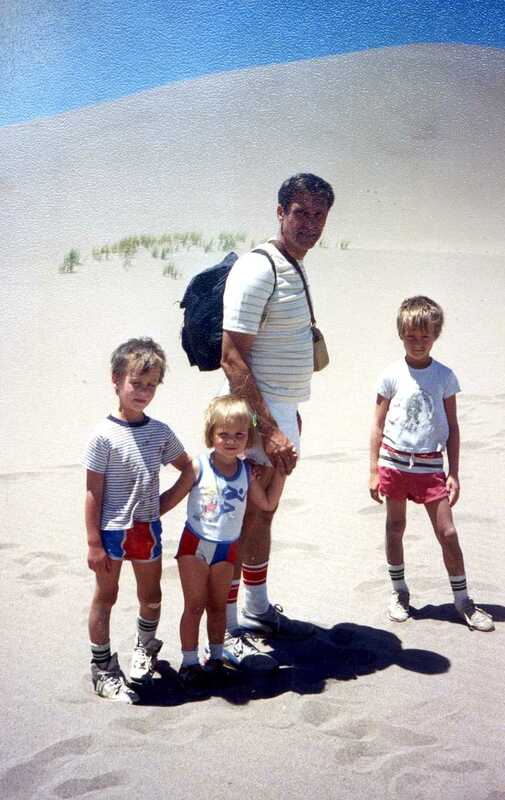 (Colorado often turned cold and rainy when we camped with our kids, which led to us discovering the Great Sand Dunes, a GREAT place for kids.) But research also contributes ideas and details. 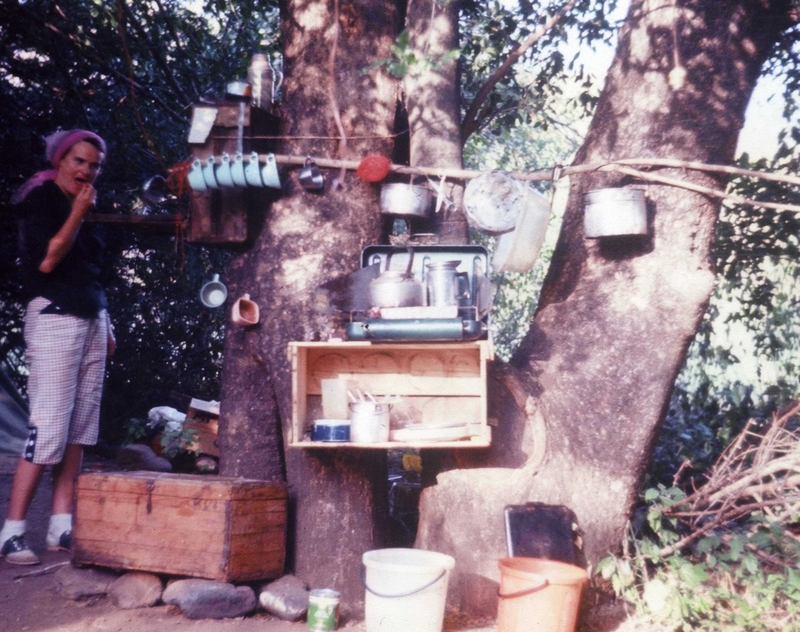 I asked a few people–and my editor asked a few people–for their worst camping experiences. Lanie’s family got to inherit a few of those worst camping experiences. Observation is key, too. The more books I write, the more impressed I am with the power of keeping my eyes open. (This is my #1 strategy, now, for getting unstuck.) 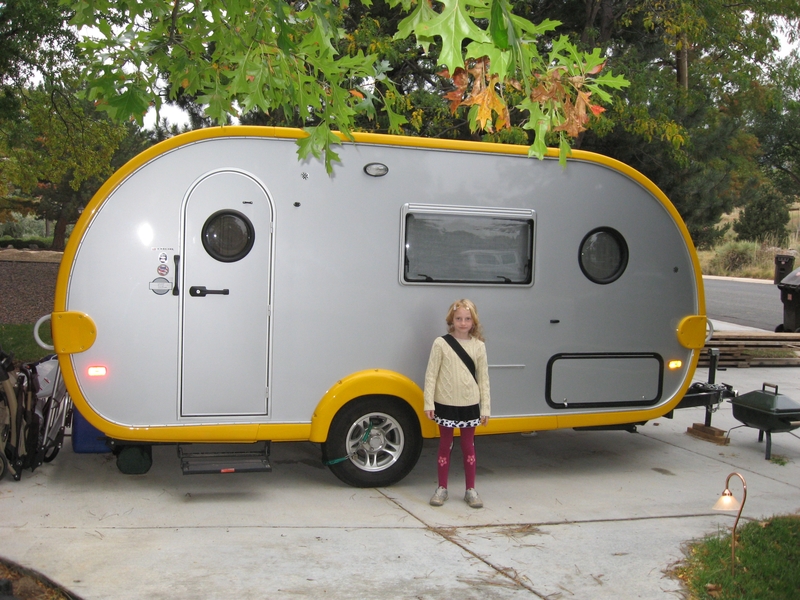 I was doing an author visit in Marley’s school when I encountered this lovely little camper and stuck it into my file to look at every time I needed to imagine Lanie’s aunt’s camper. 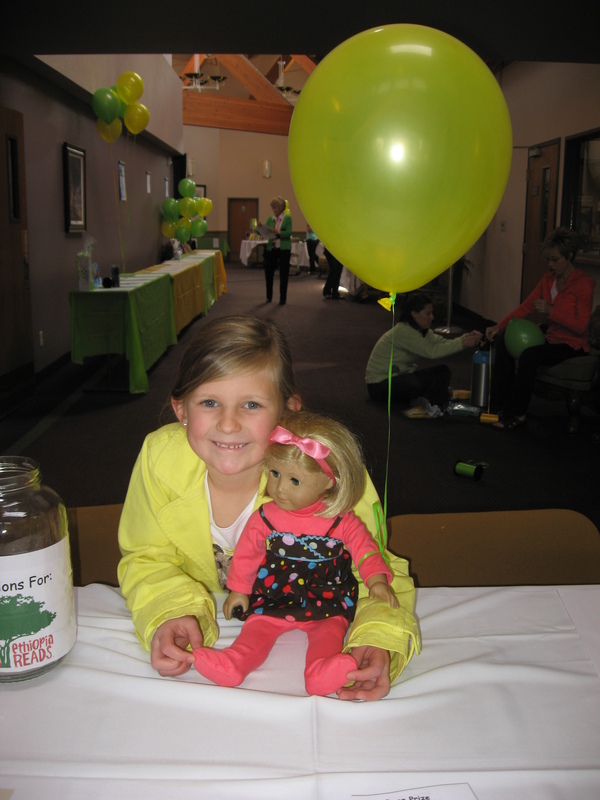 Marley’s family was involved in a meet-the Lanie-a uthor fundraiser for Ethiopia Reads in May. All the girls (and their families) who came to hear about gathering ideas and details for Lanie’s books also helped get books to kids in Ethiopia. So I got to see Marley again (and thank her for her help even though she didn’t know she was helping), and watch her with her Lanie doll. 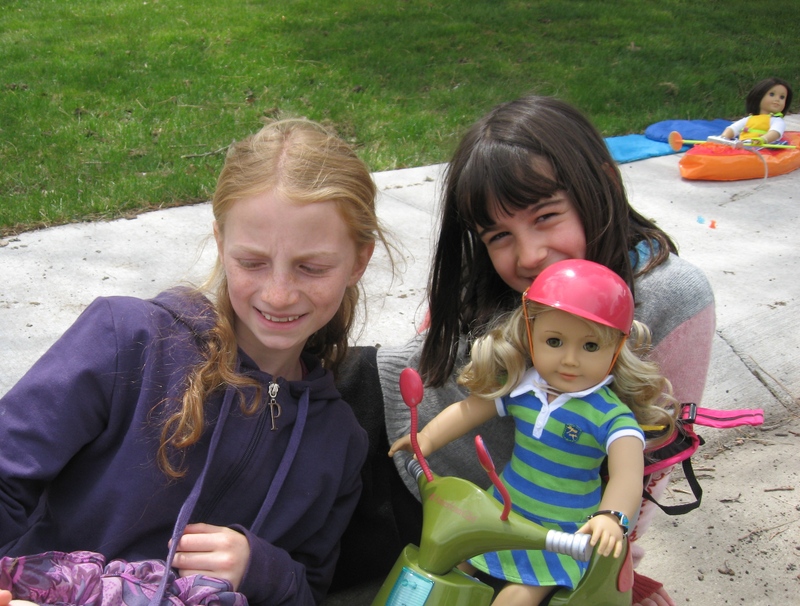 She and her friend were crafting all kinds of adventures for their dolls, including camping. 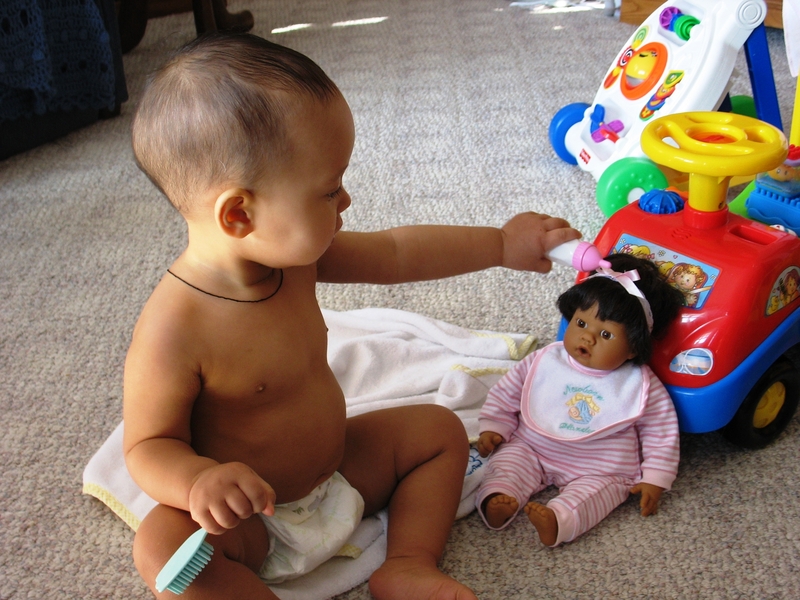 Those were the kinds of things my sisters and I did with our dolls, making up adventures for them day after day…which led me right back to memory. Wowee. 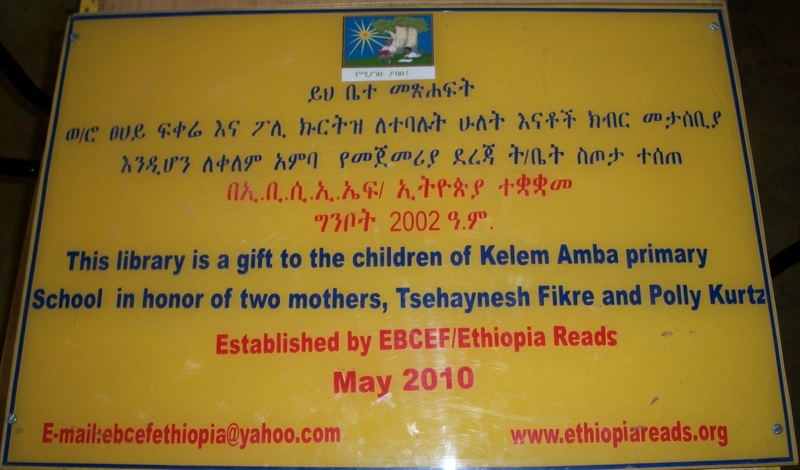 Recently, my siblings and I (and our families) raised and donated half of the money necessary to plant a library in the neighborhood of Addis Ababa where we spent so many fascinating childhood days. An adoptive family donated the other half in honor of their son’s birth mother. Today, we got to see pictures of the new library for the very first time. 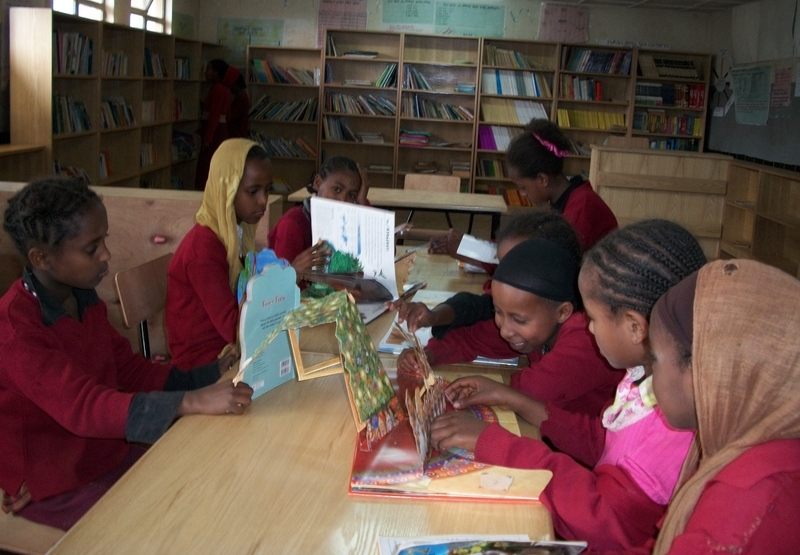 In all of these schools where Ethiopia Reads has planted libraries, kids learn to read–without then having anything to read. Reading, as I wrote a few days ago, gives us strong, brave hearts, which made all the difference for my mom who grew up poor in Iowa and lived a big, wide life because of books. Yes, she was the one with the inside genes in my family. 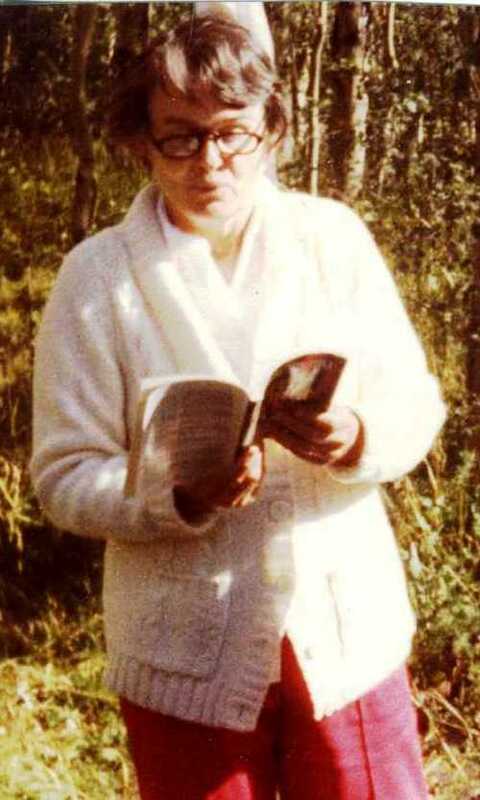 She was the one reading on camping trips (and putting on lipstick). We knew she went along reluctantly with all of Dad’s energetic outside adventures. But I’m proud to say that when she decided to be part of the Ethiopia adventure, she leaped in feet first. During every year we were there, she gave us curiosity, gave us books, gave us words, gave us delight in reading and stories. What did (or does) your mom give you? What do you have the power to give back? One school where reading isn’t treated like a chore is Bank Street School in NYC. 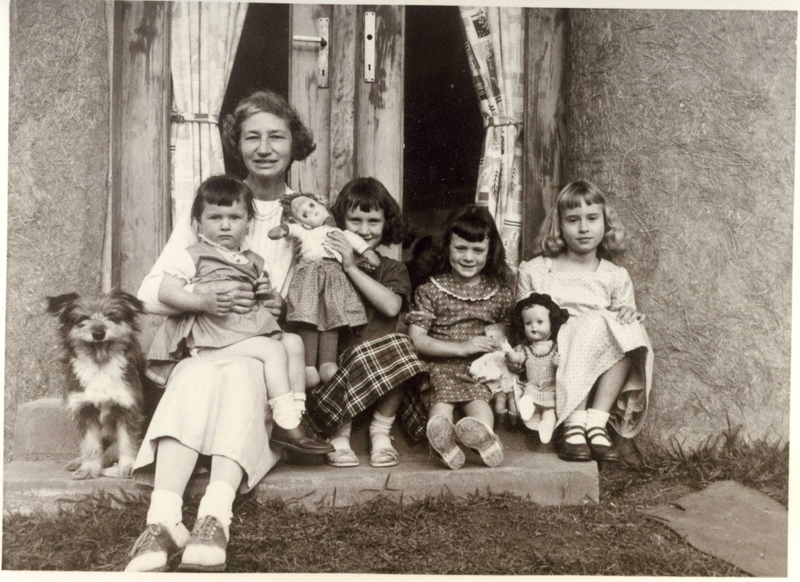 Margaret Wise Brown, the author of The Runaway Bunny and Goodnight Moon and other books I read to my kids (and now read to my grandkids) became a children’s book writer at Bank Street School. 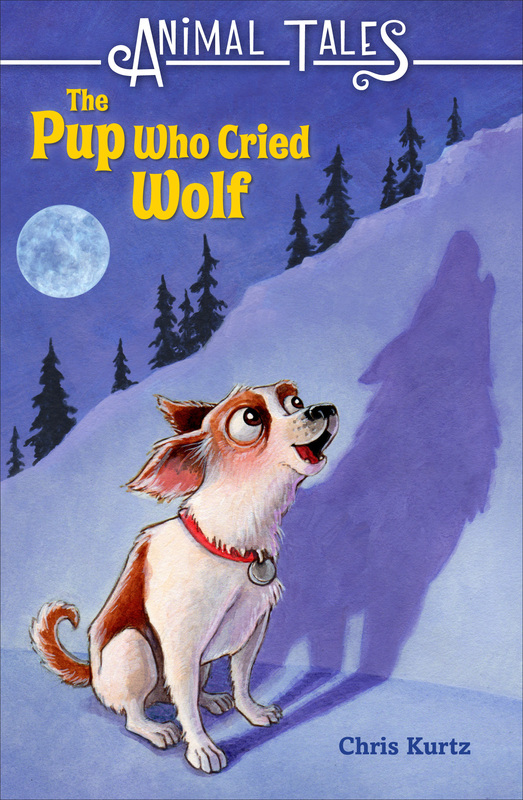 Little Golden Books (remember The Poky Little Puppy ?) was partly born there. 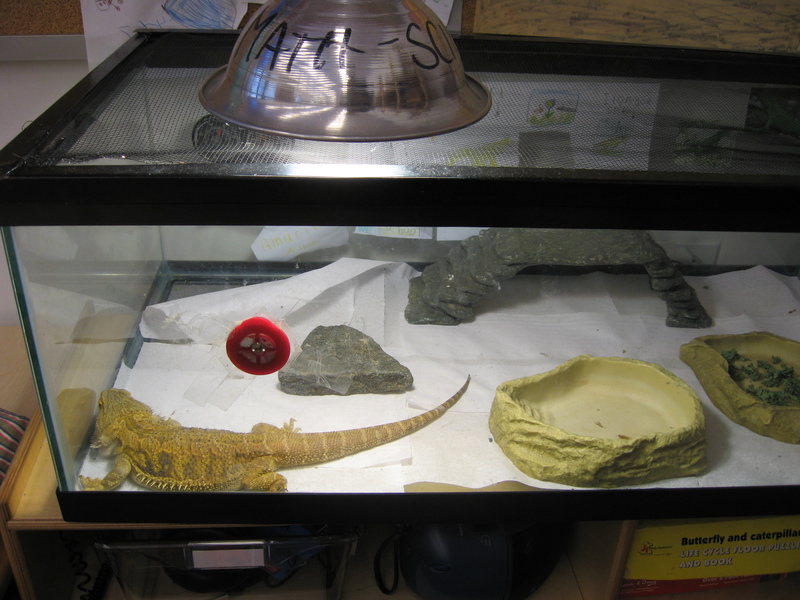 I loved having my feet touch those floors…I loved meeting this charmer whose name was Pumpkin or Prickles or some such. I loved seeing the touch-taste-smell-sound-taste education still going on in the classrooms. I loved the playground (like Lanie’s school playground) up in the air. 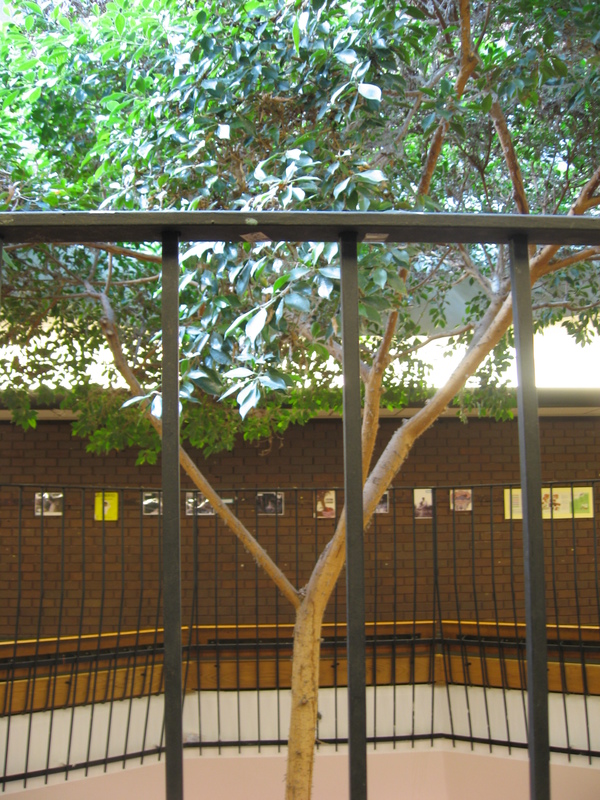 I loved seeing a tree growing right in the middle of the lobby. 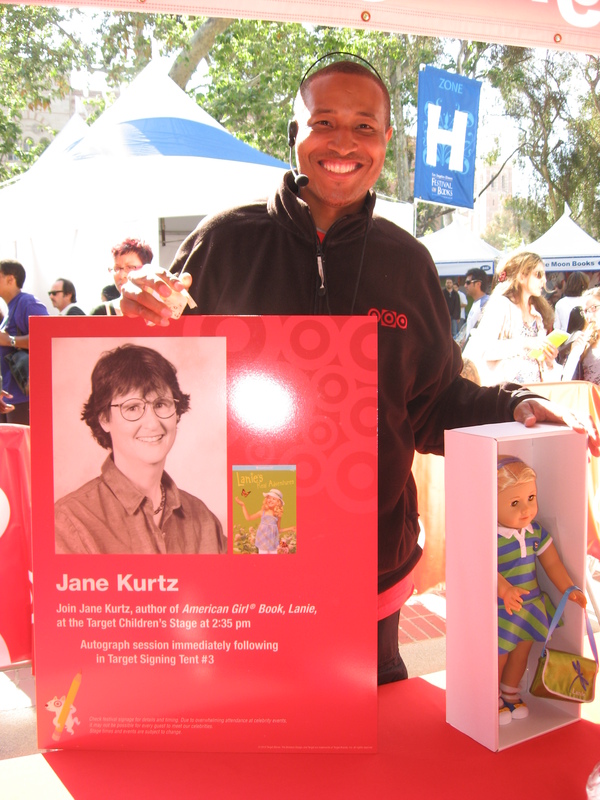 At the Bank Street School store, I bought puppets–orangutan, monarch, ladybug–to help me be less nervous about going onto the stage at the LA Times Book Festival without my pictures I get to show other places. It turned out the stage was about as intimidating as I thought it would be. Musicians were on the Target children’s stage before me. Fancy Nancy was on after me. 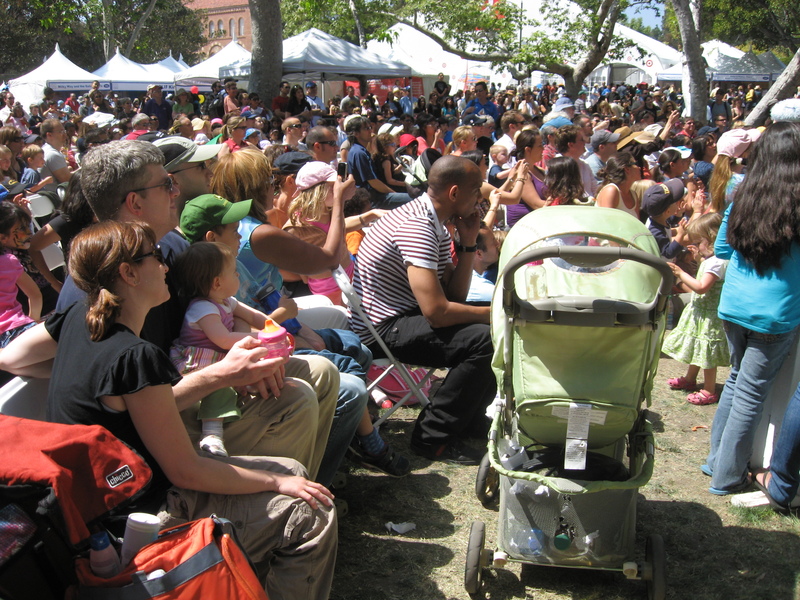 I had no idea what I was going to do with that big ol’ crowd of families celebrating books in the sun as they watched and listened. 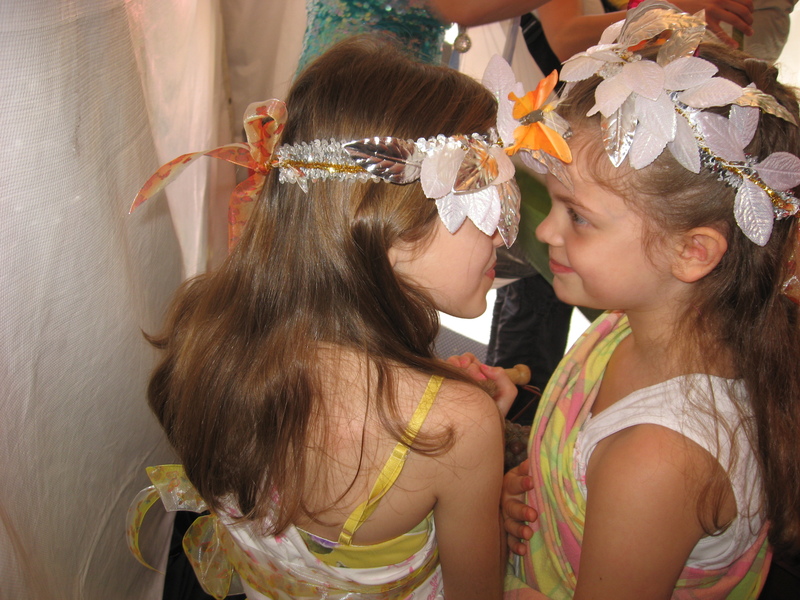 Luckily for me, a line of girls was crowded right up close to the stage to see Lanie, so I could ask them some questions–and show everyone my orangutan and ladybug and monarch butterfly–and let them listen to some bird calls. 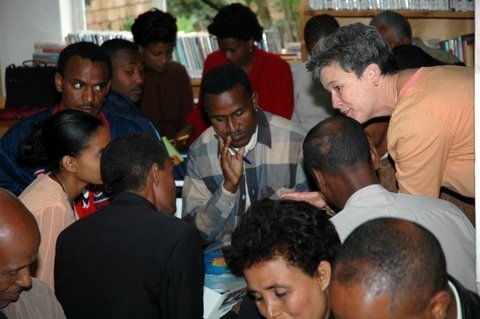 Astonishingly to me, I even sang a song from Ethiopia that I share with little kids in author visits. 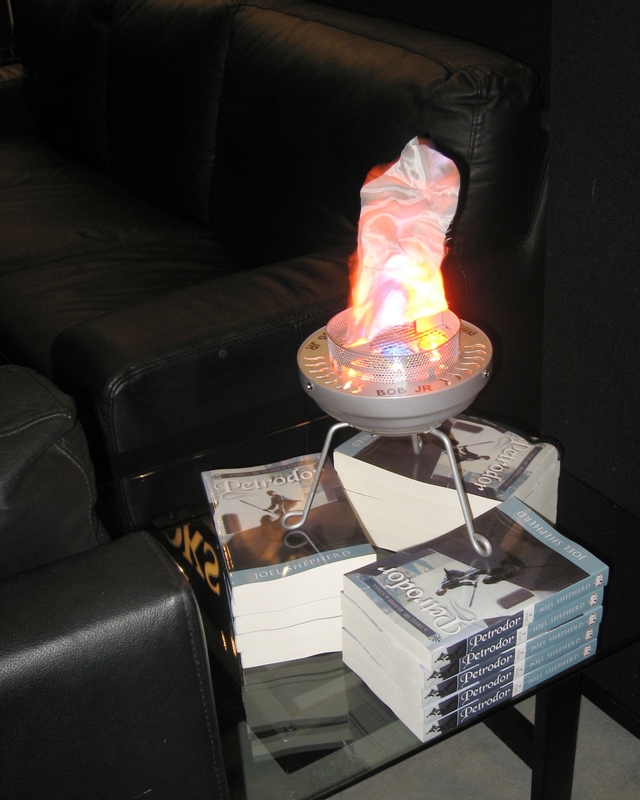 I moved from there (with my guide…reminding me of the time I did a school visit and some 5th graders asked me, “Where did you ditch your body guards?”) to the signing tent, where the helpers graciously extended my signing time for about an hour to accomodate all those Lanie fans. Lanie has groupies. Who knew? 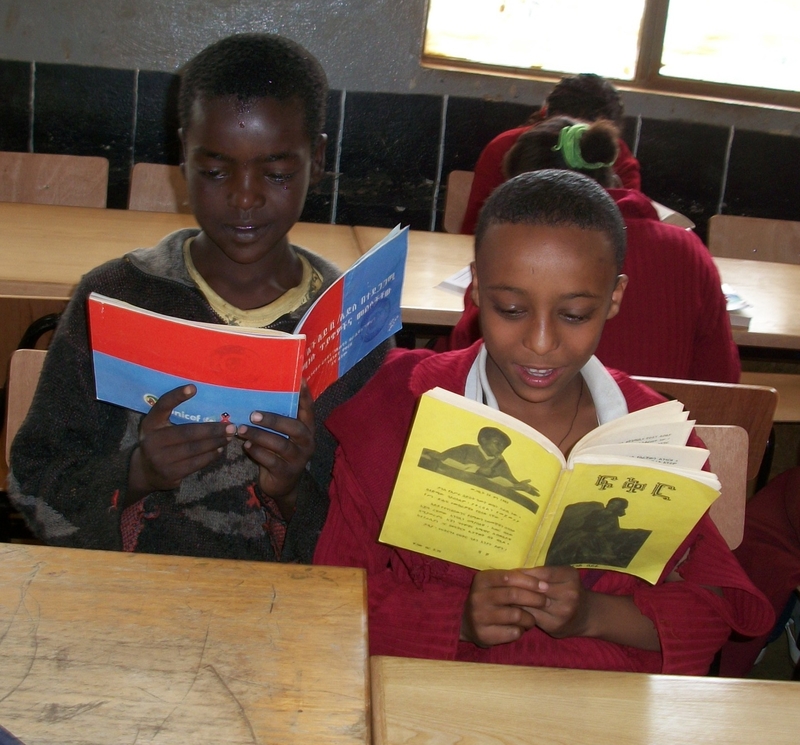 One of my most fun bits was getting to sign books for an old friend from Ethiopia. Even though I was thinking of Ethiopia Reads (www.ethiopiareads.org) when I made Lanie a girl who believes in the power of one person to change the world, I didn’t know my worlds would weave together in such interesting ways this spring. 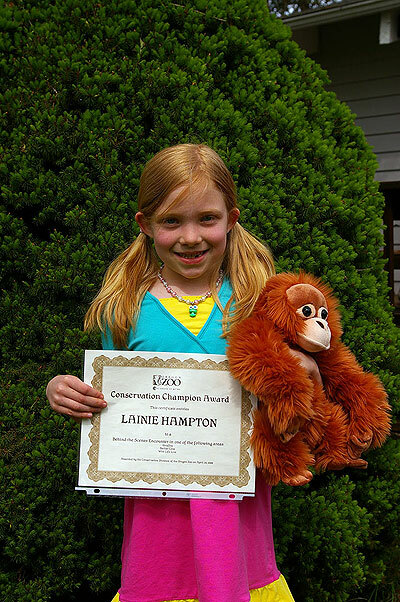 You know you want an autographed Lanie! 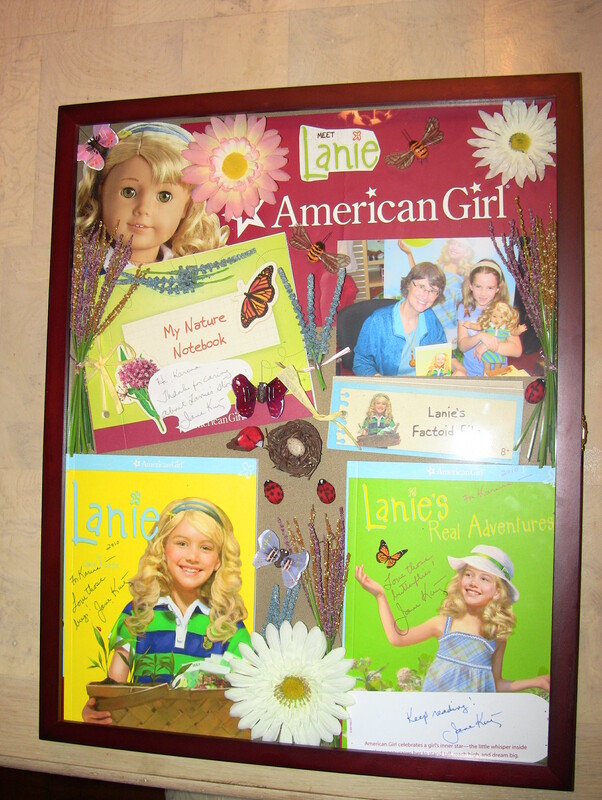 Another family shared this shadow box that they created after meeting me at the American Girl store in Dallas. I want to be able to do things like that with all the pictures and things I collect on my journeys. 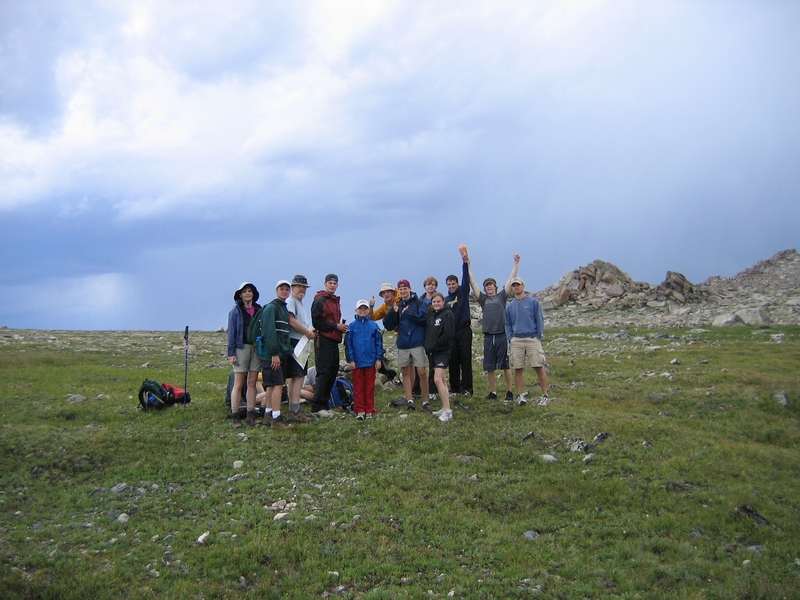 This Sunday, I’m sitting and remembering those kids and their families and the grown-up volunteers who worked so hard on the fundraisers for Ethiopia Reads in Denver and Boulder last week . People gave their time–one of the most precious things we have to give–and their money. 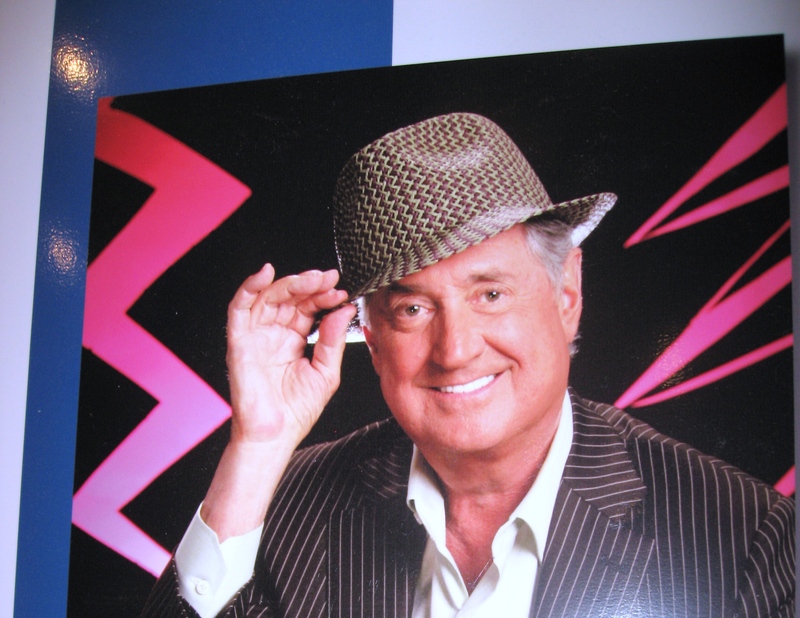 Three families at the fundraisers gave generous donations and won the chance to have tea with…well…with ME! Tea was gorgeous and fun. 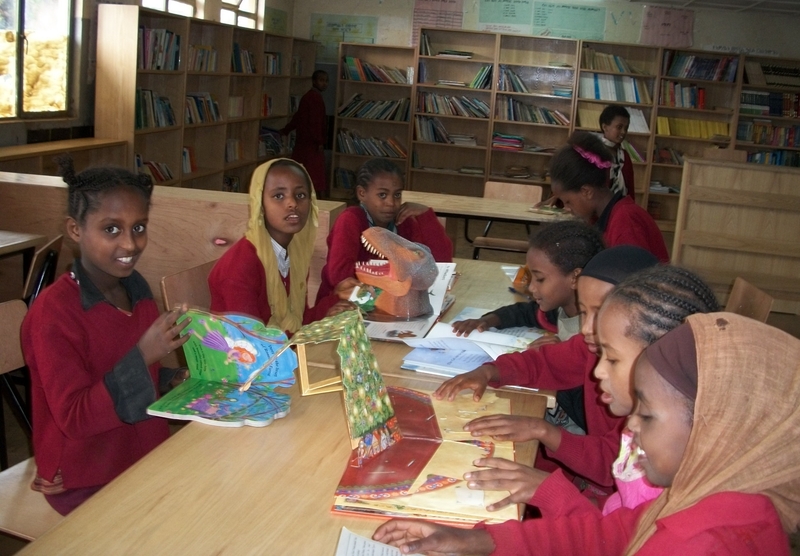 But even more exciting, that money will send books to Ethiopia. And you? 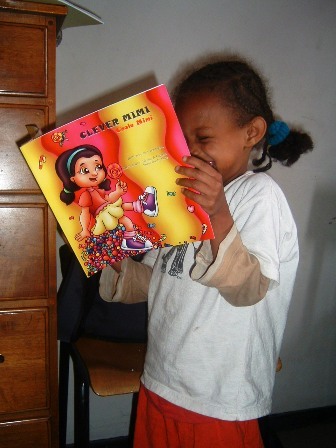 You can go to www.ethiopiareads.org and order one or more of the autographed copies of Lanie that were left over from the fundraiser. Remember your local school, your local library, your friends and relatives. 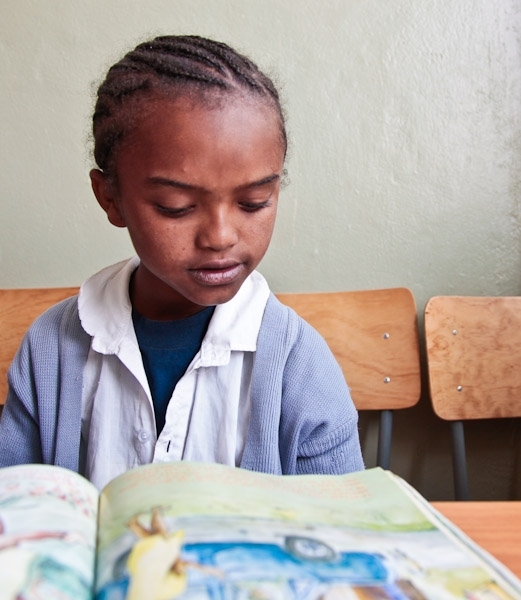 The money will make a big difference in Ethiopia, where girls like this are holding books for the very first time.